is an original oil that features two beautiful tropical Bird Of Paradise, and has been painted with the effect of being matted in a sage green silk-like design. Canvas is painted on all edges, so no need for a frame, if you don’t want one. 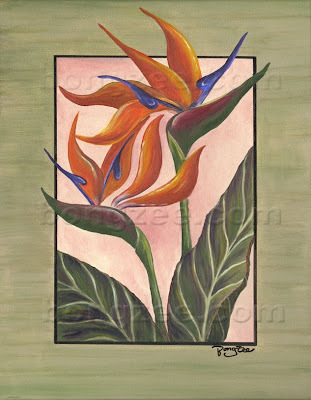 The inspiration for this painting was my beautiful Bird Of Paradise plant that I have had growing in my garden for over 13 years. To me, the Bird Of Paradise is one of the most beautiful of all the tropicals. I am lucky enough to be able to grow them in my yard here in Hawaii, and their bright vibrant colors always bring a smile to my face. They are truly fascinating. What could be better than a brilliant colorful sky overlooking gorgeous turquoise waters and a palm tree lined shore. With the world famous landmark of Hawaii, Diamond Head, as your backdrop, you won’t ever want to go back home! 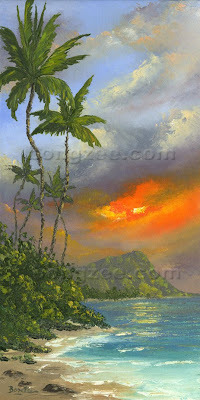 MAHALO (Thank You) for taking the time to view my artwork. in a bad (and good) way. I often think about the events that took place on March 14th, 2008. 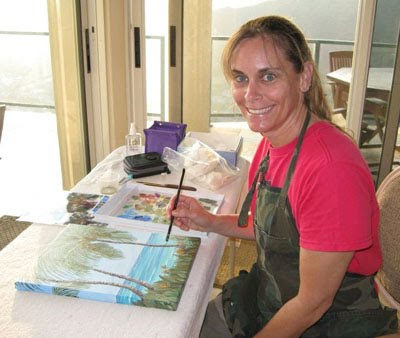 People say everything happens for a reason, and although what occurred that day is not something I would want to re-live again, I do believe it was a blessing in disguise…… It got me back into painting, to doing what I truly love to do. Here is the story of how I “re-became” an artist! Dean and I were psyched for another awesome snowboarding day. 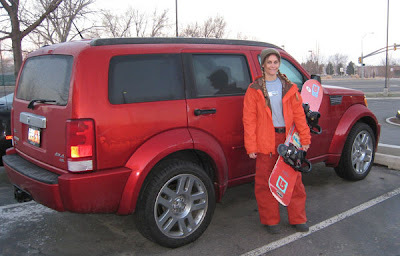 We had been going back to Brighton for over 6 years and always had a blast boarding the light dry powder that Utah is known for. The day started out with SNOW…. And more snow…. And more snow…. 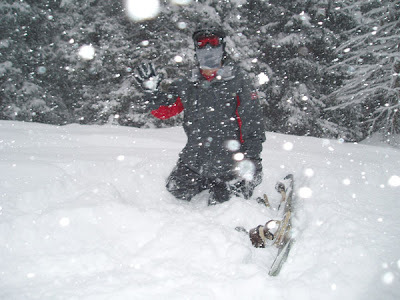 Here is Dean resting in the knee deep powder. The snow was constant and never let up the entire day!! We had been addicted to doing “tree runs” the past few trips, and this day was no different. 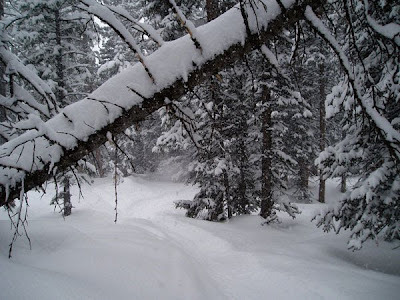 Tree runs are not really designated runs, but the sections between the marked trails, often thick with trees. (isn’t that always the way?). Here I am taking a quick rest before our last tree run of the day. We headed back through the trees. 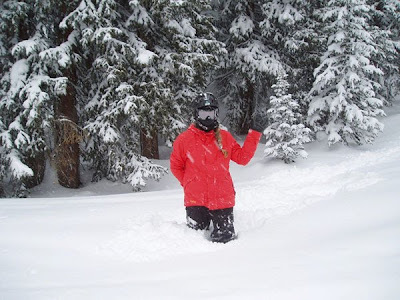 I hit deep powder and lost my balance. I fell on my A$$, but because the hill was so steep, I kept sliding down. And of course, there was a large tree right in my path. My board and legs went one way and my body went the other way, wrapping around the tree, bending my knee in a way a knee is NOT suppose to bend! I could feel it instantly, and I KNEW I was IN BIG TROUBLE. Dean helped me try to stand up, but as soon as I went to put weight on my right leg, it gave out completely. I knew the vacation was over……….. The ride down the mountain in the “Meat Wagon” as they so call it, was hell (although I must say, the Brighton ski patrol did an awesome job, and I am forever grateful to them). The emergency room was hell, lying around in the hotel for three days until we could fly back home to Hawaii was HELL. …… To make a long story short, the next couple of weeks, I would rather not redo. After the surgery, my prescription was “couch for 4 months”. I was not allowed to put an OUNCE of weight on my leg . Here are the two long screws that now hold my knee together. I had suffered a tibial plateau fracture. Basically, I had completely crushed the section of bone below the knee cap. The whitish area underneath the screws on the left hand side is a “filler” that they used to replace the bone that had been smashed. It is a new composite that actually is stronger than replacing it with bone from another section of the body. (I was very thankful for this new invention, as it saved me from having to take a section of bone from my hip to replace here). I spent day after day, week after week, vegging out on the couch during the day, not being able to get around at all. It gave me a lot of time to think. Think about my life and what I REALLY wanted to do. I realized that life goes by pretty quick and I didn’t want to waste it. I wanted to spend it doing something that I really loved. 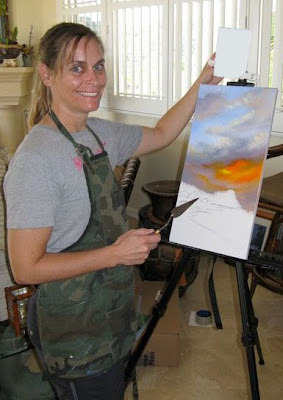 I thought about painting and how, before, I never seemed to “find the time” to get back into it. Now, I had all the time in the world. 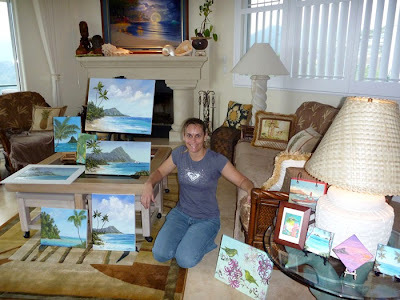 I wanted so badly to be able to paint during these four months, but being confined to the couch, it wasn’t an option yet. But I could draw! And so I did. A lot. 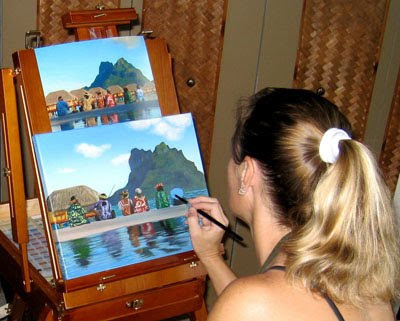 I also watched Bob Ross and other painting shows on TV day after day after day… I became inspired and couldn’t wait until I could get around just enough to be able to paint. Weeks went by and I was now starting Physical Therapy to learn to walk again. Physical Therapy first started with just trying to bend my leg a little underwater with no weight. How could something that seemed so easy be so difficult to do??? My leg had totally atrophied down to what looked like a chicken leg, and even the simplest thing like trying to flex and point my toe was a major event. My knee started to get locked into a semi-bent position, and I had to do daily exercises to try to get the range of motion back. 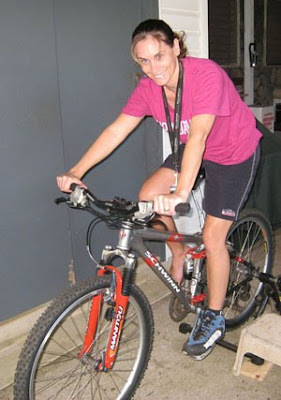 For many weeks, I couldn’t even bend my knee enough to make a full rotation on my stationary bike. 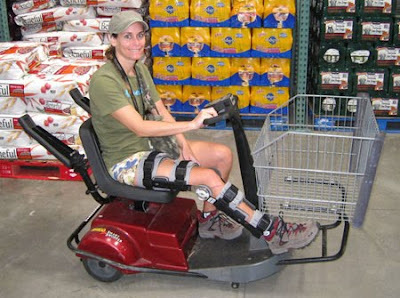 I didn’t really go many places because of my condition, but trips to Costco were fun. I could ditch my crutches while there and hop in one of their little scooters. What fun it was to do “donuts” in their large aisles! I’m surprised they didn’t kick me out! 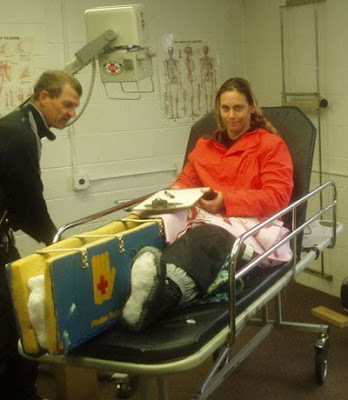 My Physical Therapist said that a person with this type of injury would most likely never snowboard again. This BLEW ME AWAY. She must be crazy!!!!! Where did she get that idea? My surgeon had other suggestions for me. In fact, he told me to “book a trip” for next year, and I did, right then -- Not knowing HOW I would be doing only 7 months down the road, when the trip was scheduled for. Could I really get back out there and snowboard again? If he thought I could do it, then I KNEW I could! 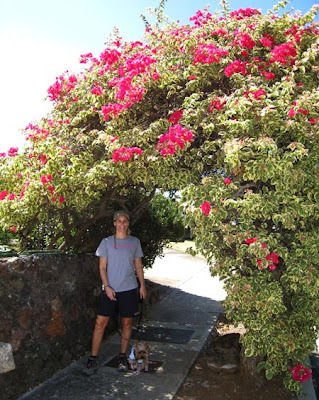 Here I am on my very first walk, almost four months later, without the use of crutches. What a WEIRD FEELING!!! When I could finally hobble around enough to get to my canvases and brushes, I began painting again. It makes me happy and I find it strange that it took an accident like this to make me realize that. 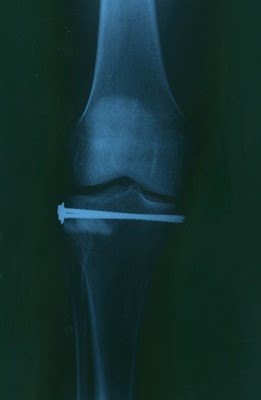 I do not regret for a minute that I did get hurt and have to now live with a “screwy knee”. I have healed, and can snowboard now even better than before! And, best of all, I have painting back in my life! 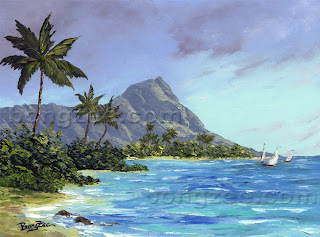 MAHALO for taking the time to read my blog. Spend the day sailing the gorgeous turquoise waters of Waikiki, with the world famous landmark of Hawaii, Diamond Head, and lush tropical palm trees to add to the beautiful scenery.